To further his training, Master Luo sent him to Grandmaster Wang Peisheng' home for direct intensive training where he practiced very hard and developed his fighting skill to a high level. For many years, Lu has regularly started training from five o'clock in the morning for about three hours outdoors in whatever weather or season. For Lu, as for other serious practitioners, hard practice is supplemented by rigorous analysis and research, always seeking to perfect one's skill. 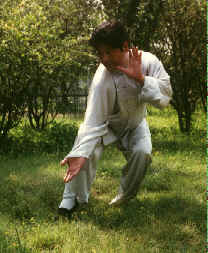 For example, while first learning Liu (Dekuan) Style Bagua with Master Wang, Lu went to Master Wang's home twice a week. In each two or three hour long private class, he may have learned just one skill, asking Master Wang to explain every small movement in detail and trying to feel it again and again. Even this was not good enough for him, feeling also the need to practice hard and try out his skill with others. Lu would test everything during his practice and fighting and then check his feeling with Master Wang again. Currently, he enjoys a good reputation among Beijing martial artists for his practical knowledge and skill. Copyright (c)2003, Zhang Yun All rights Reserved. Lu Sheng Li has studied traditional Chinese martial arts since he was ten years old. He first studied Chinese wrestling with well-known master Han Ying and later studied Baiyuan Tong Bei Quan with famous master Li Shusen. Finally, he became an indoor disciple under Wang Pei Sheng's number one disciple, Luo Shu Huan, studying Taiji Quan, Bagua Zhang, Xingyi Quan and some other styles. Lu has been actively teaching martial arts for more than fifteen years at the Beijing Information Technology Institute, and for the Beijing Wu Style Taiji Quan Association and the Yin Cheng Gong Fa Association. As an assistant of Master Wang, he has helped organize and teach classes and seminars for many years, including assisting Master Wang in training many foreign visiting martial arts practitioners. In 1993, when Master Wang visited the United States to teach a week long workshop at A Taste of China in Virginia, he chose Lu from among his many students to accompany him as his teaching assistant.